Oscar the cat became famous because of his uncanny abilities to predict the imminent death of patients residing in a medical facility in Providence, RI where Oscar resides and roams freely. Oscar would visit the patient's room just before they would die. 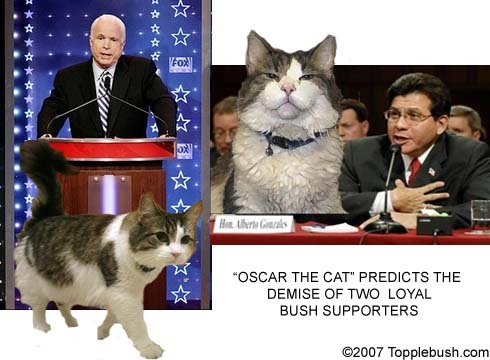 We have depicted Oscar predicting the demise of McCain's campaign and Gonzales' stint as Attorney General.